We are delighted to launch our seventh National Literacy Trust Hub today, in partnership with the North Yorkshire Coast Opportunity Area. 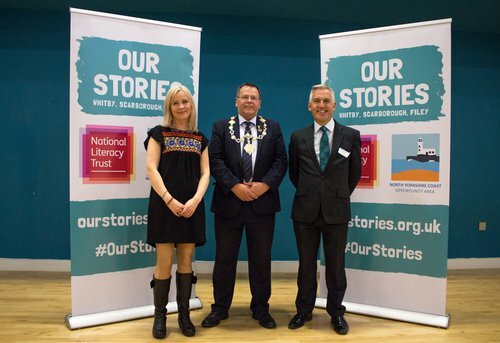 The new Hub on the North Yorkshire Coast will be known locally as Our Stories: Whitby, Scarborough, Filey. National Literacy Trust Hubs work within communities to tackle low literacy levels that are seriously impacting on people's lives, by working with local partners to create long lasting change. The North Yorkshire Coast joins our existing Hubs in Bradford, Middlesbrough, Peterborough, Swindon, Nottingham and Stoke-on-Trent. Funded by the North Yorkshire Coast Opportunity Area, the Hub will encompass a range of projects and initiatives to give young people the literacy skills they need to succeed in life. Activity will support three of the four priorities of the opportunity area: literacy, early years and ensuring there are more good secondary school places for young people. A range of initiatives driven by local schools, government and other organisations in recent years have boosted educational outcomes across the North Yorkshire Coast, and significant progress has been made. However, the area still faces challenges, with poorer children falling behind even before they start school. In 2017, half of disadvantaged children (50.8%) on the North Yorkshire Coast did not achieve a good development at age five, compared to 30% of their more advantaged peers. These challenges continue as pupils get older - 38.4% of children on the North Yorkshire Coast did not achieve the expected reading level at the end of primary school in 2017, which compares to just 28% of children nationally. Not enough young people achieve well in English when they leave secondary school, and some 2,000 are currently in a school that does not have a good or outstanding rating. The National Literacy Trust Hub on the North Yorkshire Coast will bring together local partners to champion literacy. An area-wide campaign will inspire parents to share stories with their children every day, and community literacy champions will promote importance of reading, writing and talking. Our Stories officially launched on Thursday 4 October with a literacy-themed bus tour of Whitby, Scarborough and Filey. At each stop, pupils from local primary schools climbed on board the bus to enjoy an interactive storytelling session with Ceridwen Smith from the Stephen Joseph Theatre. Ceridwen highlighted the importance of literacy skills and inspired pupils to read and tell stories. Pupils were also gifted a brand new book and an Our Stories bookmark to take home. The day finished at The Street community centre, where over 50 key partners from across the area gathered to celebrate the launch and hear about plans for the Hub. Speakers included National Literacy Trust Jonathan Douglas, Hub manager Liz, Councillor Joe Plant, Robert Robert Goodwill MP and opportunity area director Richard Benstead. To celebrate National Poetry Day, attendees also enjoyed an inspirational poetry performance from local poet Katharine Boddy. Find out more about the National Literacy Trust Hub on the North Yorkshire Coast. Images by Jacob Lucas Photography.